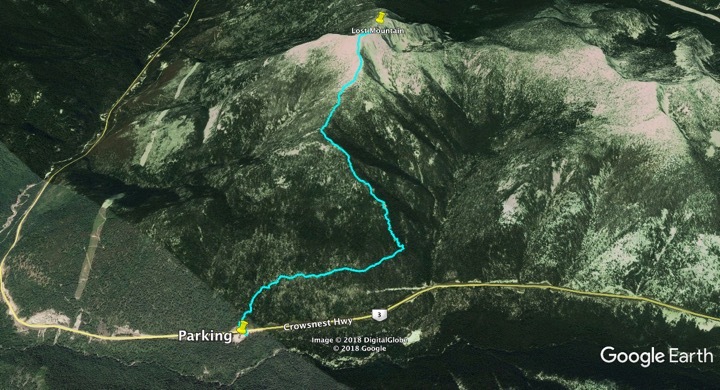 The Lost Mt trail is 6 km one-way with ~1100 m of elevation gain. After the initial steep section, there is a pleasant forest walk over rolling terrain. The climb begins in earnest after 2 km, with a steep section leading to a viewpoint at ~1600 m elevation. Beware of cliffs by the trail at the viewpoint. The trail heads west along a ridge from here, rising steeply at times and then turns northwest at ~1800 m. Trail markers will bring you above treeline where the trail ends at ~2000 m. Normally the summit can then be seen above, at ~2150 m.
Use caution when crossing the highway to access the trail. It can be busy and traffic is high speed. Be sure to carry enough water because there isn’t any on the trail. At least 3 litres per person is recommended in summer. Stay on the trail. There are many ridges leading down from the high terrain in different directions, so it is easy to get lost! Weather conditions at the top of the trail can be dramatically different then at the trailhead, even in summer. Be sure to pack appropriate clothing and supplies. If you are going to the summit you should be equipped with a map and compass and/or GPS.